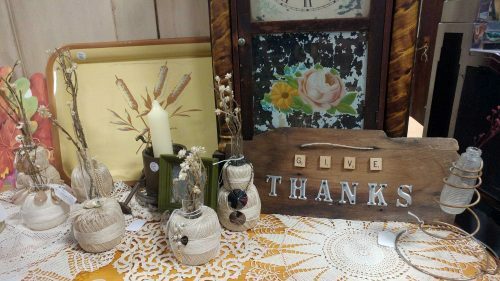 Looking for something to mix into your Fall decor — something that will work with your country burlap and chicken wire looks as well as it will with more simple styles and even more elegant looks? Perhaps something that will work not only for today but can also work for your Thanksgiving table? Check out these handmade vases! I like the mix and contrast of glass, metal, and thread. Tone on tone ivories and whites makes for an elegant sort of rustic glam, which is perfect for Fall decorating. 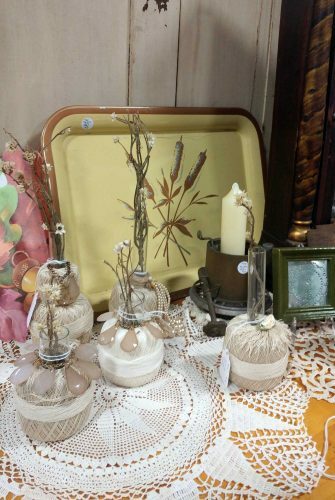 The delicate dried flowers gives them a more elegant look. But you can use fresh flowers — or, my current obsession, air plants. The neutral tones allow for these little vases to work into many decor styles — and be flexible enough to change with the seasons! Sadly, I no longer have the publication nor even remember its name. (If you know it, please do let me know so I can properly credit the idea!) But I loved the look so much that I kept the idea in my head. It didn’t take long to stumble upon a box of vintage and antique balls of Coats & Clark crochet thread at an estate sale. It took longer to find the glass pieces for the vases themselves. Eventually, I scored a box of vintage glass cigar tubes. But the box of crochet thread was now buried in storage… You crafters and collectors know how this goes. Years of moving didn’t help. But recently, when we cleared out our storage unit, I found the boxes one at a time… One by one I dragged them home. Finally, decades later, I was able to put these beauties together! While I adore the ivories and whites, this idea has lots of possibilities — including more color! Colored balls of floss or thread can be used. And the decorations can be colorful too. Here are some made with colorful thread balls, paired with vintage diaper pins, hair barrettes, and buttons. They are very cute for nurseries and little girls’ rooms. To make these, all you need are balls of crochet thread, glass cigar tubes (or test tubes or other small glass tubes or vases). 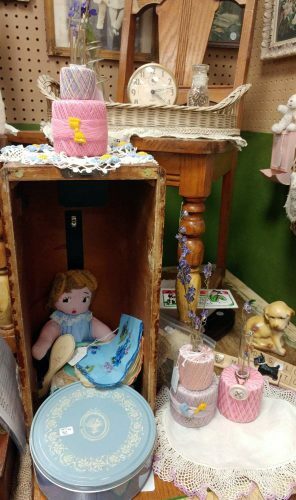 If you don’t have such vintage items on hand, you can try Etsy, of course. Or, if you are excited and would rather not wait (or risk the scenario I described above! ), you can get new items at Amazon for this vintage look: Crochet thread balls, test tubes. Assembling them is relatively easy. The vintage glass cigar tubes have rounded bottoms, so they must be hot glued or otherwise affixed to the paper bottom of the balls of crochet thread. For best results, I recommend putting the plastic seals on the top of the tubes to use. Simply cut off the part which would fit tightly inside the tube. Now you have a tiny flat-bottomed “dish” which can be filled with hot glue. Fit the round bottom of the glass tube inside the little dish of glue and hold ’til it sets. (Low temp glue is fine.) Once that’s set, use the glue gun to apply more glue to the flat bottom of the cap piece and quickly insert it inside the ball of thread and hold it securely in place until the glue sets, affixing the whole piece to the paper bottom of the ball of thread. Once the glass vases are inserted, and, if necessary, secured in place, you are then free to decorate with bits and bobs you have sitting in your craft drawers… Bits of broken jewelry, charms, buttons, beads, sequins, bows, found objects, etc. Depending on the pieces used for decoration, you can attach them to the balls of thread via pins, tacks, chains, and even the glue gun again. I like the simple clean look, where you can see the thread and the vase. But you can create your own variations… Stack more balls of thread to hide the vases. Load up the glam by covering up the surface of the balls of thread as much as you’d like. 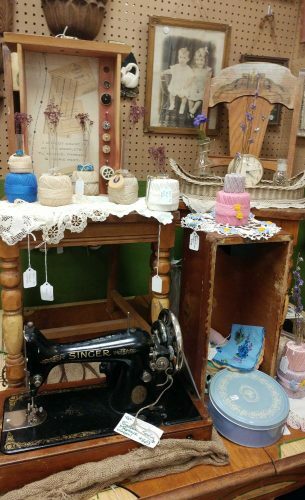 All of these vases can be found in our booth spaces at both the Fargo Antiques & Repurposed Market & the FM Antique & Repurposed Market. 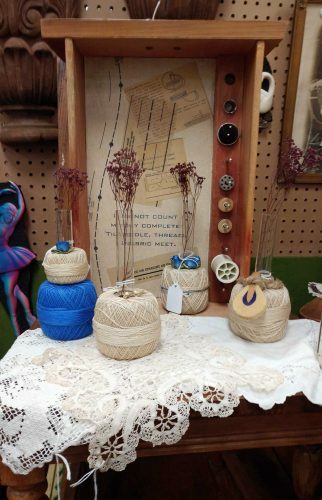 Small vases (single ball of thread) are $12; larger floss vases are $16 each. As always, if you are interested in any of these items or any others on our site, contact us! We do ship (in the U.S.).